We're posting a series of short profiles that will collectively provide a starting point for an exploration of international blogs, online magazines, and pages. We began by looking at Kilele, We Take Pictures Too, Arab Image Foundation, Greater Middle East Photo, Space Cadet, Street Level Japan, Kantor Berita MES 56, Japan Exposures, Invisible Photographer Asia, my new notebook, oitzarisme, La Fototeca, ZoneZero, Panoramica Galerie, and reminders: I WAS THERE. Today we continue with a look at Singapore-based Asian Photography Blog. In a sentence: Posts introduce an Asian photographer with a small well-selected group of images, a link to their page, and a paragraph or two of commentary on the work. 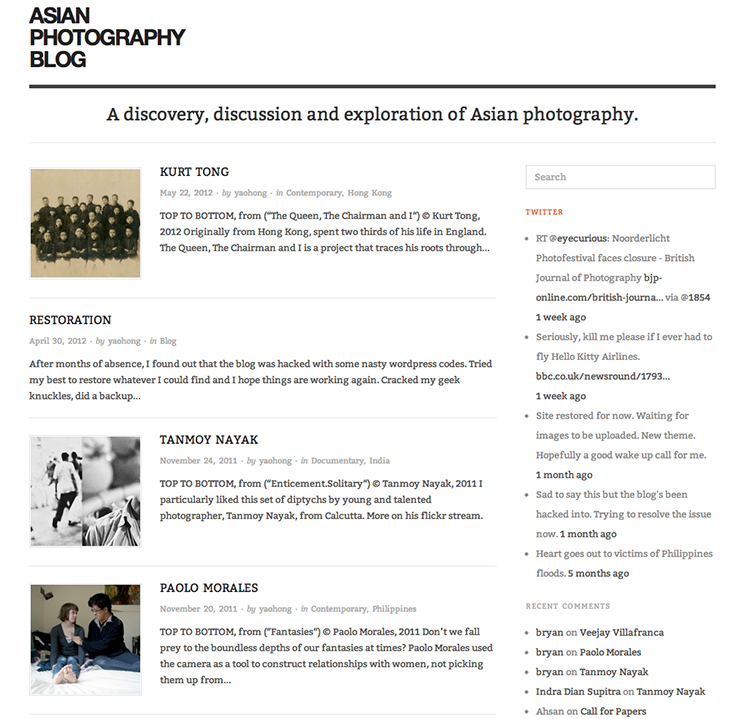 Asian Photography Blog features photographers from Greater Asia. Photographers are presented through a grouping of three of their images from a single series, followed by a short text that includes a link to the page of the photographer as well as a few thoughts on the images. The comments section provides a space for a relatively active conversation. The photographers are sharply curated, the comments informal and light. A sidebar provides a blogroll with several other Asia-based sites as well as archives. Asian Photography Blog can be found on Twitter.